We are a bakery and prepared food store in the west end of Stouffville Ontario. 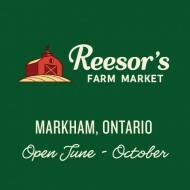 We had our beginnings at Reesor Farm Market in Markham in the 1990s. 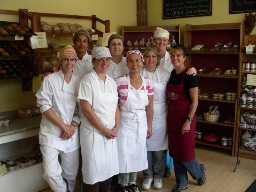 In 2004 we made the move to Stouffville and opened our new year round store, Reesor Farm Kitchen. We specialize in fresh baking and entrees. Many of our foods are made with local ingredients and we do our best to support local and Ontario wide food makers. Our products include bread, muffins, and other baked goods, delicious entrees and soups as well as preserves from our farm and from other local makers. Best known for our bread, pies, and famous Molasses Crinkles cookies, we offer a wide range of fresh baked goods, take-home entrees like Chicken Pot Pie, Farmer’s Sausage Lasagna, and Butter Chicken Curry, as well as a wide range of Ontario food products including locally-raised beef and chicken, fruit preserves, eggs and cheese. We also feature a selection of gluten-free products. Pick Your Own Pumpkins in Markham, Ontario! In the fall we have hundreds of pumpkins to choose from at our farm in Markham, Ontario. By late September or early October we offer pick-your-own pumpkins and lots of ready-picked pumpkins of all sizes. Take photos with our giant straw man too. In our Pick Your Own pumpkin patch you can fill one of our wheelbarrows full of pumpkins for $35 or pick 3 pumpkins for $25 or have your pumpkins individually weighed for 35 cents per pound. It’s free to enter our pumpkin patch! Come on out and find your special pumpkins. Right beside our pumpkin patch is our Corn Maze that is fun and challenging for all ages, so bring the whole family. Check out this year’s new design. Our Corn Maze is located beside our farm market and our pick your own pumpkin patch. There’s also pick your own sunflowers too. For any additional information, please call 905 640 2270 or visit our website.